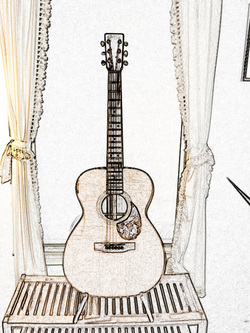 Martin guitars have been produced in Nazareth, Pennsylvania for more than 150 years. Their superb quality and customer support is second to none. Many players, professionals and recreational musicians choose Taylor Guitars for their ease of playing, modern sound, innovative designs and beautiful workmanship. Smaller volume makers are preferred by many and one of the most popular is Collings. A maker from right here in New England with a wide following for their excellent quality guitars is Pantheon Guitars, makers of Bourgeois instruments. Regardless of your level of ability you'll find something of benefit in Acoustic Guitar Magazine. The classiest publication with the most in-depth articles is Fretboard Journal. Back issues are already sought after collector's items. Two informative and interesting online forums I visit on a daily basis are The Unofficial Martin Guitar Forum and Acoustic Guitar Forum. Stewart-MacDonald Supply Company is the place to go for guitar parts and instructions on how to use them. If you are in the Boston area and need guitar repair, you can't go wrong with DJ Parsons. Here on Cape Cod we are fortunate to have access to the services of Fran Ledoux at Bay Fretted Instruments. Fran is a Certified Repairman for Taylor, Martin, Fender and others. He can do magic with broken guitars! I highly recommend the services of nondenominational ordained minister Rev. Faith Lavender if you're planning a wedding on Cape Cod. Faith will work with you to create a memorable, meaningful and loving ceremony. The classy, understated genius of Martin Taylor.